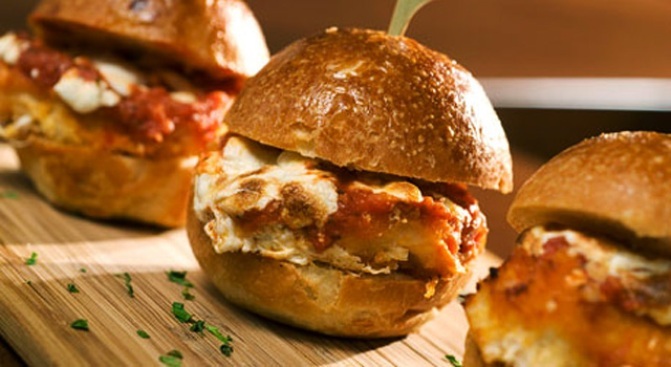 The silver-dollar chicken parm sliders at 675 Bar. Bar menu standouts: pillowy, prosciutto wrapped stracchino crescenza cheese hot pockets, the Plougman's Mason Jar (a Britishy make-your-own kit involving cheddar, ploughman's relish and pickled onion), small fish 'n chips with citrus mayo, and a "silver-dollar" chicken parm on mini-potato buns (pictured - cute!). And chocolate-wrapped bacon, if that's your thing, and by "that," we mean "food gimmicks involving bacon." Washed down with: A Rest and Recuperation (rye and rye beer mixed), several of which should guarantee anything but. Or a Riesling and lichee, a refreshing twofer which sort of ends up tasting like St Germain. Tip: This is probably the only joint within a 10-block radius where you can play Jenga and Ms. Pac-Man. Or admire a wall of books color-coordinated by jacket spines. Learn more about 675 Bar at Grub Street and Thrillist.